The Christian's are available to come to your accordion club and do workshops on playing together as a group and working together to create a good band sound and help with easy band arrangements that will help your group sound full and more professional. Playing in a band can be so much fun!! Let the Christian's teach you how to create a good sound with the members of your club. In scheduling a workshop, they would also offer private lessons and a public performance where they could help with marketing ideas with the local Chamber of Commerce etc. Please feel free to contact the Christian's in regards to any lessons or workshop ideas. Their primary goal is to promote the accordion!! 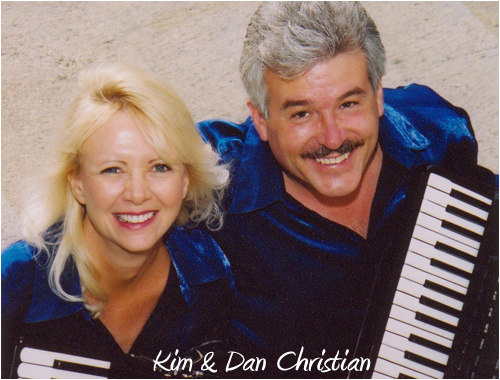 Dan and Kim Christian have established themselves as among the premier accordionist's in the world. Their unique ability to play together with exact precision is unparalleled anywhere else on the planet. They have extensive experience in pleasing audiences. With the magic of Midi accordions, Dan and Kim are able to take the place of an entire 12 piece orchestra. They have a huge repertoire of classical music as well as a great diversity of Music that includes most ethnic styles (French, Italian, Irish, German, Russian, etc.). surprising, exciting arrangements of great jazz charts, Big Band, Cajun, Gospel, Pop, Old Time Rock n' Roll, Patriotic and many others! Call today to see how we can enhance your event with the magic of live music!